With a nifty bit of stock footage, Paramount Pictures uses France as a back drop for this star crossed lovers tale involving William Powell’s con man and the lovely Carole Lombard as the woman who just might make Powell go straight. Powell, looking dapper as ever is indeed a Man of the World. He’s living in high society through a blackmail ring where by he quietly runs a tattle tale newspaper rag with a sure fire money making scheme. Before printing anything that his “mark” may not want publicised, he’ll approach them as a friend to unveil what may be coming their way. Naturally it’s a tale of high society and older men trying to keep their younger lovers a secret from their rich wives. When Powell saves his latest “mark” from certain embarrassment for the princely sum of $2000 dollars, he happens upon the man’s niece, Miss Lombard. He’ll “accidentally” find himself at the same restaurant that evening as Carole and her betrothed, Lawrence Gray. He’s quick to make friends knowing all along that it’s not Gray but Carole who he has designs on. Luckily for romance, Gray has to leave Paris on a business trip and leaves Carole to be squired about town by Powell. What do you think is bound to happen? Powell’s taking up with Carole doesn’t sit well with his silent partners, George Chandler and Wynne Gibson. Miss Gibson is feeling like the spurned lover and begins to put pressure on Powell to drop the young lady and stick to what he knows. Living the high life by criminal means. In keeping with many films of this era, Powell will need to decide if he’s going to go straight or remain a high society criminal. At seventy one minutes, Man of the World is a fast moving tale from director Richard Wallace and screenwriter Herman J. Mankiewicz (Citizen Kane). The two stars involved would soon marry in real life appearing in two more movies together, Ladies Man and the classic My Man Godfrey. Godfrey was actually made after the marriage had come to an end. 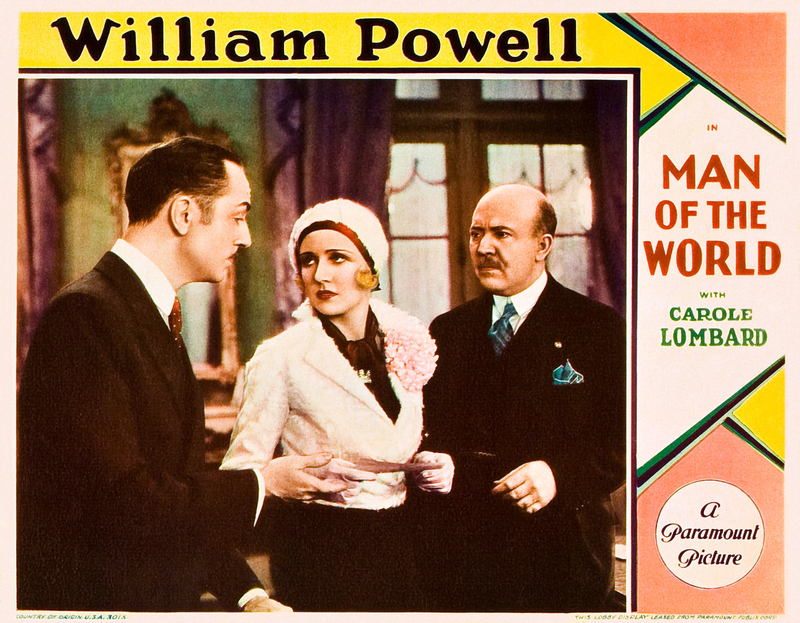 Man of the World isn’t the slapstick style of comedy that has endeared Carole’s legacy to many film goers of which I number myself but it’s a window to a time past when Carole could play most any role. Powell is Powell. He seems an actor so at home in the life of high society on screen. Here though he is actually the bad guy and not the Thin Man that he is most often associated with. This Paramount release is one of the apparent 700 titles that the studio sold off to Universal studios. Surely a mistake looking back at just how films continue to be marketed today. 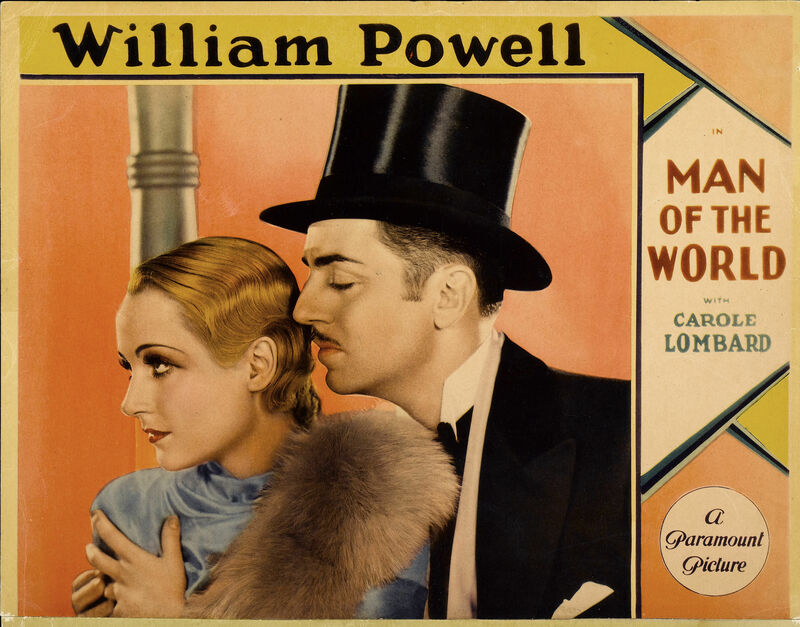 Man of the World is currently available as part of a Carole Lombard collection on DVD from Universal. I’ve always enjoyed William Powell’s films, but a tandem of Powell and Lombard sounds especially fun. And pretty cool that fifty years later, George Chandler was still making movies; I just checked, and over a 60-year career, he had 459 acting credits! The guy never seemed to be out of work!